Traveling with a bike can be cumbersome, especially without the proper carrier. And we’ve all been there taping up an old cardboard bike box for protection, but that’s seriously not the way to go. A bag or case specifically designed to protect your bike when you’re traveling with it allows you to travel in a way that is more convenient for you and safer for your bicycle. These carriers protect your bike’s structure and keep it safe so you can hit those trails when you get to your destination. However, there are so many different bike bags and cases to choose from that it can be difficult to decide on one. 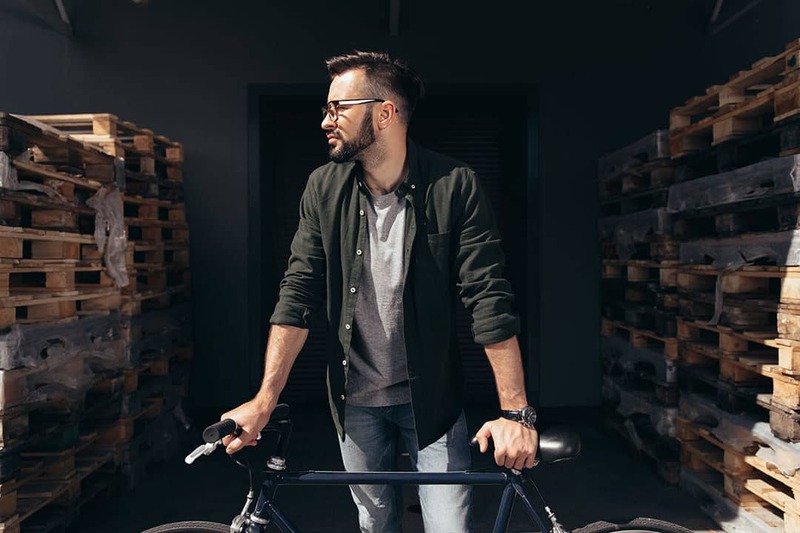 Choosing the appropriate bike carrier requires careful consideration of your bike’s size, storage, car space, as well as other important factors. Whether you’re a roadie or a mtber, there’s a good travel case option for you out there. Bike bags and boxes provide the essential protection you need to protect your bike while you travel. They come in several styles to suit your personal preferences as well as the needs of your bike. The right carrier will provide protection for your bike, and be weight and size appropriate for you and your bike. Bike bags and boxes can be expensive, however, replacing your bike would probably cost a lot more. If you’re not really sure which product is the best option for you, then maybe hearing what our editors think will help you out. Below you’ll find some reviews on a few of our favorite options on the market right now. While traveling with a bike isn’t really that common for the hobbyist, if you do any competing in races or even want to go on a cycling holiday, then you’ll need to get yourself something that protects your bike when traveling. The options you see on this page get our seal of approval. If you’re looking for the perfect intersection of affordability and protection, then this Thule bike travel case is what we suggest. In fact, even if you aren’t on a budget and are willing to spend more, we still recommend this Thule hard bike travel box over all of the other options currently on the market. We think that you’ll gain peace of mind when traveling with your bike packed away in this hard case – even if you are flying and have to check it in the hold. It has easy rolling wheels that make it easy to transport to your vehicle, through the airport, or the train station. The Thule brand is known for quality gear. Plenty of space to fit your road, mountain or ‘cross bike. Overall, this case seems well-designed and sturdy – we would definitely trust our bikes’ safety to one of these. And if you’re looking for the best bike bag for air travel, then we suggest this hard shell case right here. Though we prefer to travel with our bikes in hard shell cases, we do understand that some people prefer to go with a soft bag instead. With that in mind, if you’re going to be traveling with you bike and need a a good soft bike travel bag that is good quality, then we suggest the Evoc Bike Travel Bag. While you might be surprised to not see another Thule bag listed here, we actually think that this Evoc bag has the slight edge over Thule – at least for now! It’s an award winning bag, having earned several industry awards before being an awesome bike travel bag. It will fit your Triathlon, Roadbike, XC, DH, FR or Enduro bike – it will even fit most 29ers! It’s really easy to get your bike into this bag (much easier than the Thule RoundTrip Pro XT) – just remove the handlebar, pedals and wheels – easy peasy. The bag material feels durable and rugged and like it will protect the bike through rough baggage handling. It has two carry handles and it is easy to pull around on the wheels. The zippers can be locked, which is great for when you have to be apart from the bag during transit. 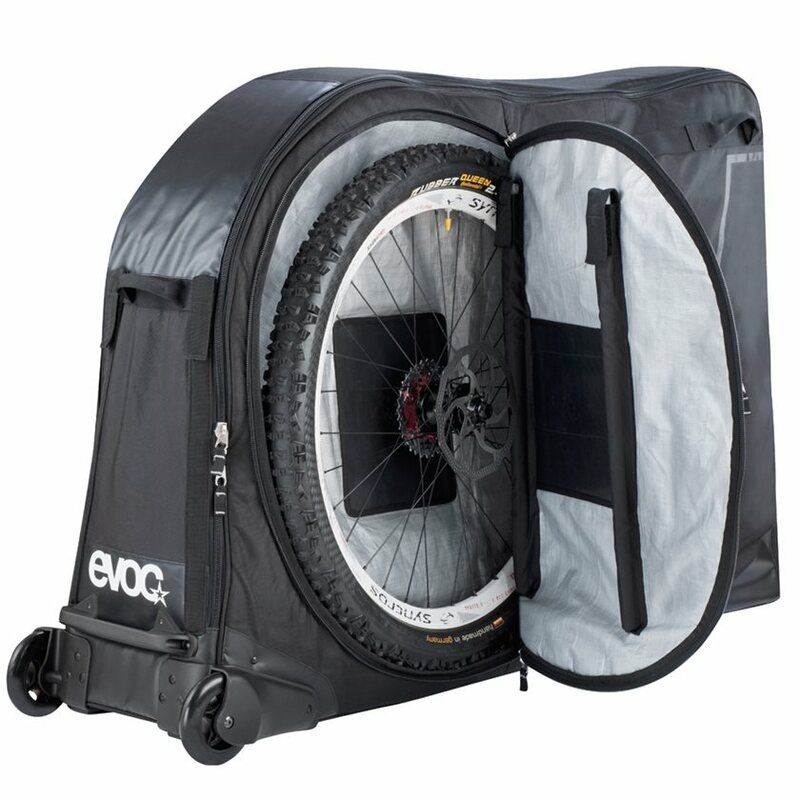 Overall, for a soft bag we don’t think that it gets any better than this Evoc bike bag. We’d expect this bag to last you through several years of travel (though we haven’t used it extensively and cannot guarantee that). 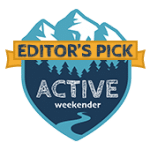 Though we never suggest option for the cheapest product on the market when it comes to outdoor gear, we are sympathetic to outdoor enthusiasts on a budget. With that in mind, if you’re going to be traveling with you bike and need a cheap bike travel bag or case that is of decent quality, then we suggest the DAKINE Bike Roller Bag. As you can see in the image above, this cheaper option does look quite as nice as the Evoc bag up above it. But, if you’re shopping based on price and can’t get a good deal on the Thule hard shell case or the Evoc bag, then we think that this is your next best option (though do check prices above for the other bags first). Wheels roll smoothly for transport. Fits your downhill, 29er or road bike. Overall, we just don’t think that this DAKINE bike bag has all of the bells and whistles that you get for the money with the Evoc or the Thule. But at the end of the day, it is still a solid choice for protecting your bikes when traveling. And hey, it’s a hell of a lot better than using an old bike box! Although both a bike bag and case provide essential security, there are several different points that you should consider to help you choose between the two. A soft bag is lightweight and easy to carry. This may be appealing if you are flying to get to your desired destination. A lightweight carrying case may also be better suited to meet the recommended weight limitations that most airlines require. In addition, a softer lightweight bag will more than likely be cheaper than a hard framed bike box. However, a hard bike case box provides more protection for your bike, even though it may be heavy and somewhat bulky. A hard frame provides more protection because it can withstand knocks and bumps during travel. A soft bag generally won’t provide the same level of protection. Luckily, there is an option that falls between a bike bag and case. You can choose a bike bag that comes with inserts that add additional structural protection, like a hard framed case. However, this type of bag will also provide the benefits of a lightweight bag. There are certain features that you should pay attention to when selecting a bike bag or box. These details will save you time and make transporting your bike easier. Consider your personal needs. Your personal needs include the space you have in your car and the storage space in your home. Aside from this, you should also consider the size of your bike in relation to the carrying case. The bike should fit into the carrying case with ease. As a result, you may need to measure the dimensions of your bike before you start shopping for a bike bag or box. Luggage of any kind is usually not subject to the best handling at airports and other travel venues. As a result, it’s a good idea to consider padding when it comes to selecting a carrier. Adequate padding ensures that your bike is protected from hard knocks and scratches. This is true even if it falls, is trampled on, or buried under a sea of luggage. You should also consider how easy or hard it is to pack your bike in any bag or box that you choose. This is an area where knowing the dimensions of your bike and the amount of space that any bag or box provides, can be helpful. Moving about with your bike can be cumbersome if your bike bag or case doesn’t have certain helpful features. Wheels and handles can often make the difference between carefree mobility with your bike in tow or awkward and clumsy navigation. Wheels make it easy to push and pull your bike as opposed to carrying it. Furthermore, recessed wheels provide extra protection from damage because they fold back into the bag or box until you push or pull your carrier. Handles are just as helpful as wheels. Handles and straps make it easy to lift your bike when needed and push and pull it as well. Although locks can provide peace of mind when you travel with your bike, they can also slow you down. Moving through customs at the airport can be inconvenient if you have to unlock your bike bag. Deciding to invest in a bike carrier with a lock should take this fact into account. However, peace of mind is often worth the extra time that a locking carrier would require. Packing your bike isn’t necessarily a speedy process. Packing requires you to disassemble your bike and place the parts in specific places inside the carrier. However, there is a general packing process required regardless of the type of carrying case you use. The wheels are usually removed, and the handlebars should be turned to the side. The seat post can be removed or dropped into the frame as well. Lastly, the rear derailleur should be removed. These steps are usually required to pack a bike, regardless of whether you are using a bag or a box. However, there can be some variation in these steps if you are using a bag with special inserts that fit into the carrier. In addition, you may need to perform a few added mechanical steps. These steps are easy if you have a spanner. The chainset can be removed which will provide extra protection during travel. However, when you get where you’re going you’ll have to reassemble it. This is why it might be best to avoid this step if you can. Consider the various benefits and features that different bike bags and boxes provide. This will make it easier for you to choose the carrier that will best suit your bike and your lifestyle. Consider the size of your bike as well as the carrier that will be best for your travel. Although a lightweight bag will be easier to carry, it won’t provide the same level of protection that a bike box provides. However, you might get some of the benefits of both a soft bag and a hard box by investing in a bag with inserts. This type of bag will provide more protection and still have the benefit of being lightweight. Ultimately, the decision should be based on your individual preferences, and needs.